Combining microwave power and electric heating elements delivers a rapid, high quality cooking technology that simultaneously cooks food through the centre while applying temperature to the surface to ensure crispness, texture and colour. Electric combination ovens are simpler to install than gas combination ovens and generally you have more options in terms of the positioning of the units. They avoid many of the food quality problems associated with cooking using only microwave heating, while retaining similar rapid cook times. We stock a wide range of ovens from several manufacturers including Rational and Lincat with six, ten and 20 grid options available at price points to suit many budgets. Please bear in mind that electric combination ovens are high powered units and some require three phase power - see our guide to electricity supply for commercial catering appliances for more information. 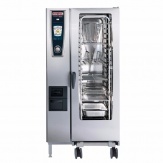 The SelfCookingCenter range of combination ovens by Rational represent the most advanced combination oven technology available, with a range of cooking modes including dry and wet heat cooking, standard combination, steaming and finishing. 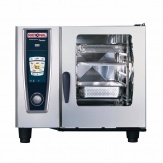 SelfCookingCenter's are efficient and versatile and come with an impressive two year parts and labour warranty as standard. 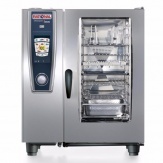 A range of sizes and capacities are available and all Rational SelfCookingCenter's and CombiMaster Plus units are equipped with the automatic cleaning function and characterised by extraordinary robustness for top food quality. Doors can be right hand or left hand opening. The majority of the units are high powered three phase power as standard unless ordered in single phase which is only available on the 6 grid units.